In the past, it’s been nearly impossible to access IPOs and secondary offerings of publicly traded companies before their shares become available on the exchanges. But not anymore. TradeStation clients now have access to certain ground-floor investment opportunities available in the mobile-first ClickIPO app. To get started with ClickIPO, all you need to do is open and fund a TradeStation equities brokerage account and maintain a minimum balance of $500. Once your account is funded, simply install the ClickIPO app on your mobile device and link it to your new TradeStation account. 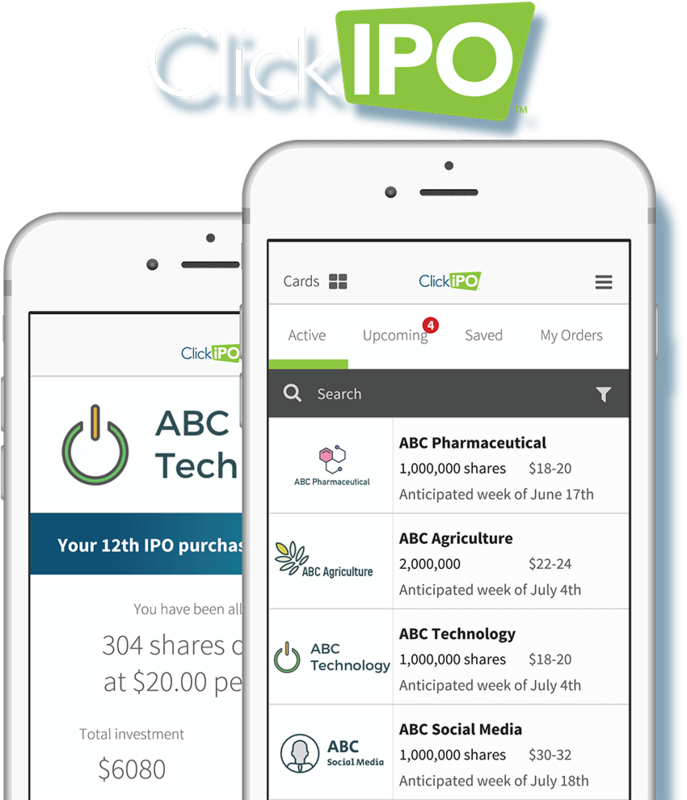 With ClickIPO, you can browse IPOs and view the price range, anticipated offering date, SEC prospectus and more. You can then place a conditional order for shares through your TradeStation account. If shares are allocated, they will be placed directly into your account. Link your new TradeStation account to the ClickIPO app. The opportunity to participate in certain initial public offerings, follow-on offerings and secondary offerings (sometimes collectively referred to herein as “Offerings” or “an Offering”) is provided by ClickIPO. Eligible customers may place conditional offers to buy shares in an Offering with ClickIPO. There is no guarantee that you will receive any allocation of shares in an Offering. Purchases will be executed through a TradeStation brokerage account linked with ClickIPO. By linking your TradeStation brokerage account with ClickIPO, you authorize TradeStation to disclose certain of your personal data to ClickIPO in order to allow ClickIPO to provide its services to you and facilitate your participation in Offerings, and for the purposes of allowing ClickIPO to generate reports, statistics or other analysis for use in improving and promoting its products and services, and for any additional use necessary to expand or implement new features. Eligibility for participation in ClickIPO’s services with a TradeStation brokerage account is reserved for brokerage customers who maintain a minimum balance of $500 in their equities brokerage account. TradeStation is not affiliated with ClickIPO. If you live outside the U.S., your account may be introduced by our affiliate, TradeStation International Ltd. There are risks associated with investing in Offerings. Those risks are described at length in the prospectus used by the company conducting the Offering, and we urge you to read the prospectus carefully to understand those risks before investing. You should make your own determination of whether an investment in the Offering is consistent with your investment objectives, financial situation and risk tolerance. An initial public offering is the first sale of stock by a private company to the public. A follow-on offering is an issuance of additional shares of stock by a company that is already publicly traded. A secondary offering is a registered sale of previously issued shares held by existing shareholders. Offerings are risky investments and may not be suitable for all investors. Read more information regarding the significant risks associated with investing in initial public offerings.